Nice closeup of consoles, wall console and that big screen thingy, probably HDTV for watching the sports, I dunno, do they relax in the future? I’ve never even seen a toilet in these things. Also, we will be selling the new line as two main boxed sets. The first is a large starter set with walls, doors, floors and varied furniture such as consoles, cloning chambers, turbines, etc. What do you get in the starter set? Walls. Lots of walls. Have some floors to go with those walls. 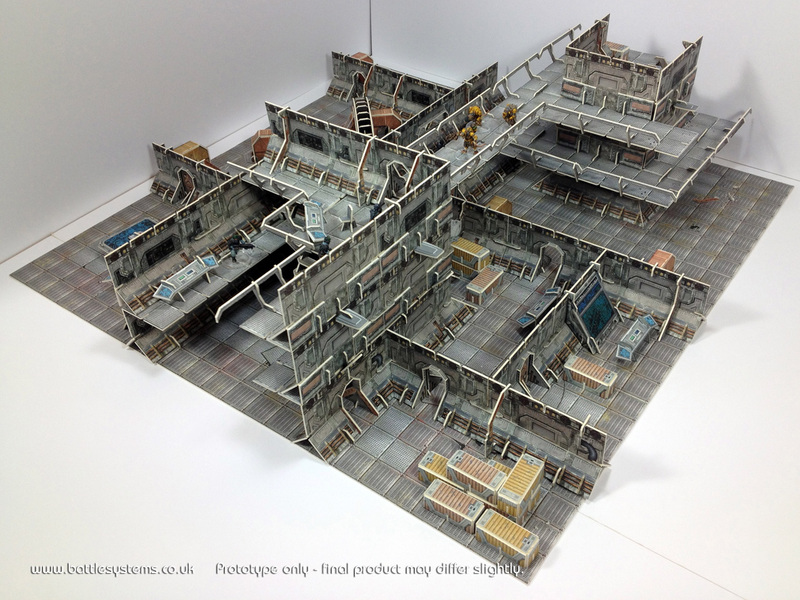 The second is the multi-level expansion set which has more walls, wall fascias, gantries and everything else you need for high level skirmishing (the exact contents may change prior to manufacture). This is what you want. You dream about it. You should probably get out more. We will also sell extra furniture and clips and have more expansion packs lined up if the line sells well. Card clips? Not on my watch. 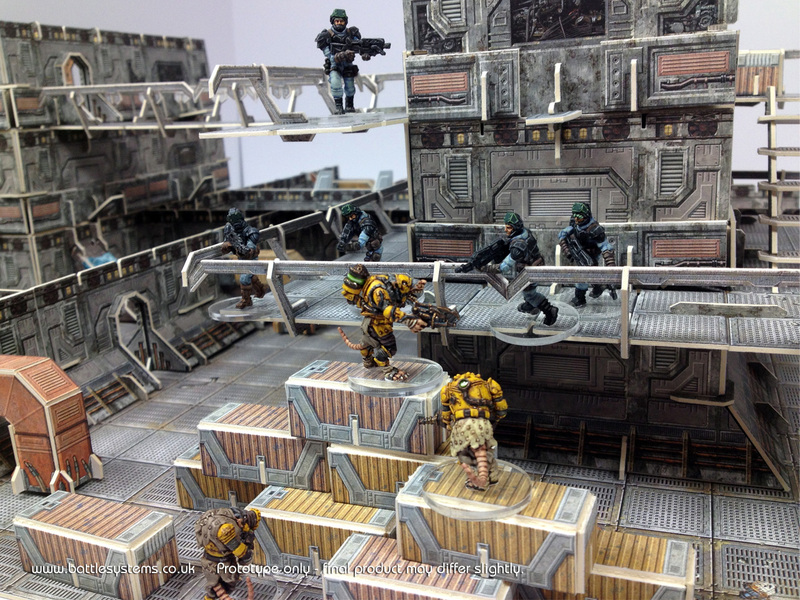 The figures were supplied by the guys at Mantic Games and painted by Rich at Sabre Minatures. If you want to stay up to date with our latest developments just click here to subscribe to our newsletter or email us at info@battlesystems.co.uk and type ‘news’ into the subject line. 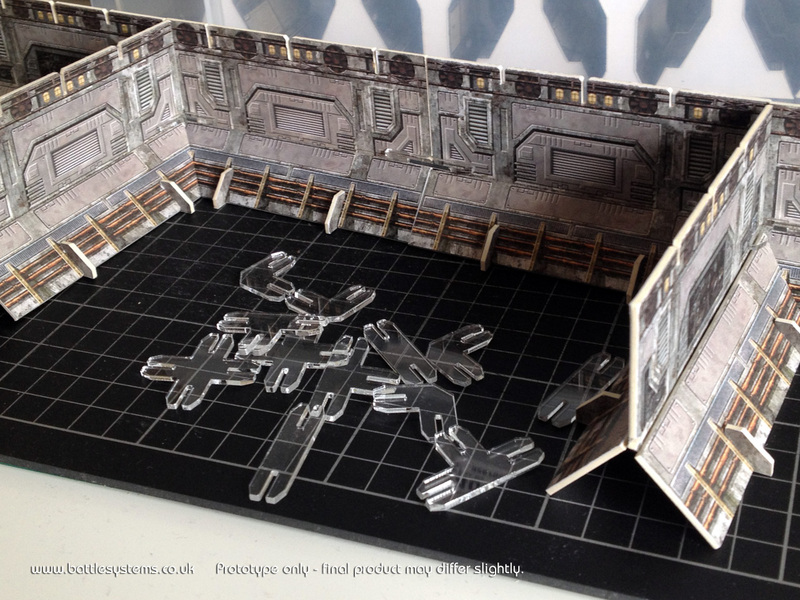 Tabletop war games are all about imagination. Few a few short hours you get immersed in the lives of the tiny figures before you, playing god and dictating fate by the whimsy of the dice. You don’t need a lot of money, in fact i’ve played games using chess pieces for figures and CDs for scenery and it was a hoot. But, the right scenery can give your games an extra dimension and more importantly, make them more fun. Use your resources to make high walls. Go on… no-one’s looking. 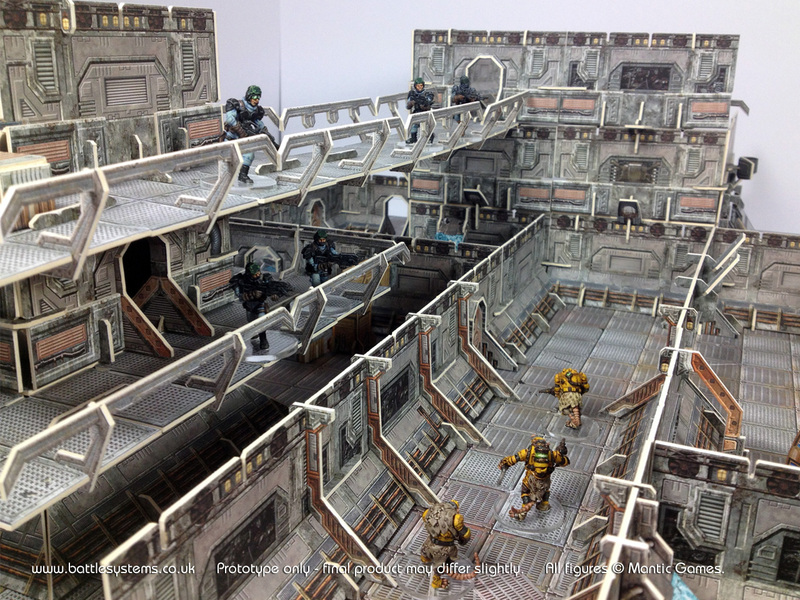 Depending on the type of game you want to play your scenery needs to be versatile. 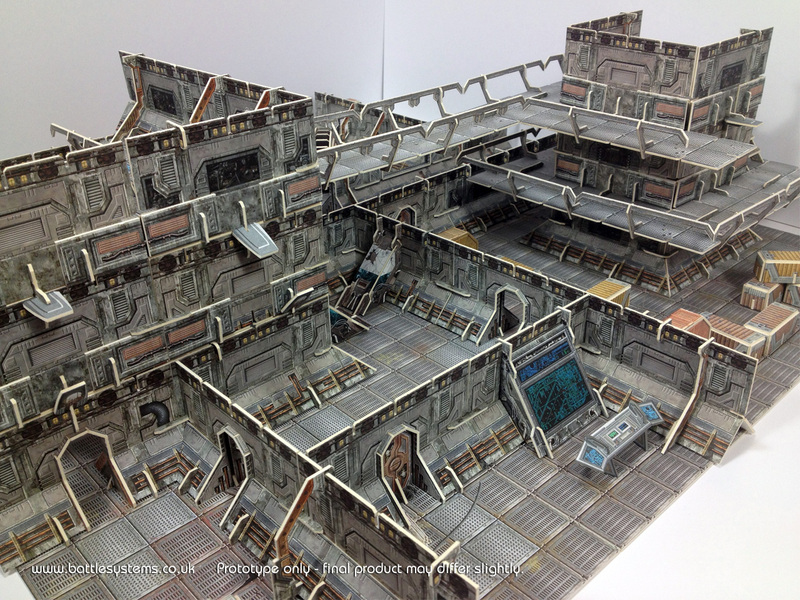 With some games you will want to make a layout that covers a large area. Other times you will want a setup with a small footprint but a high number of levels. Our new line lets you do both. 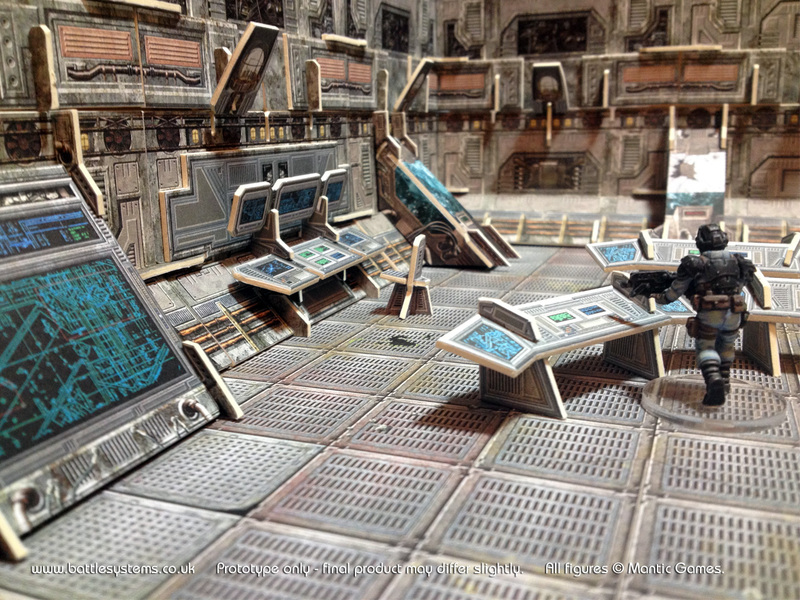 Most gamers will use the set for internal spaces such as underground bunkers, bases, and the interiors of spaceships. That needs quite a few alternate setups. For example, spaceships can have a number of small rooms or large open areas linked by several narrow corridors. If you keep everything to a single level you can cover a surprisingly large area. 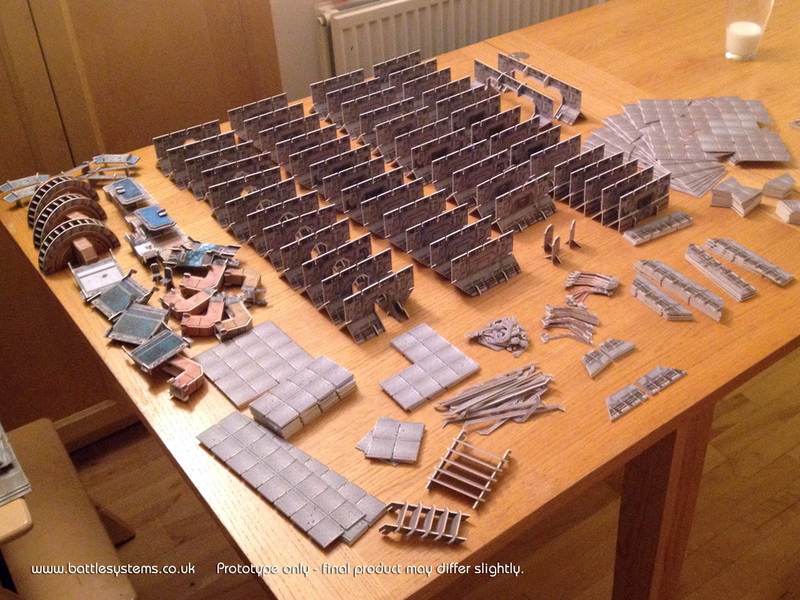 Or, if you’re into multi-level games such as Infinity or Necromunda you can pile all your resources into building upwards, the area will be the same but it’ll be in three dimensional space. And there goes the eye. My personal preference is to have a single level embedded with ‘towers’ and criss-crossed with gantries, ideal for shooting the suckers on the ground floor; partly for the fun of it but also ‘cos it’s a visual eye party. Because our system is modular you can pretty much do what you want. Extra points for inventiveness. Click on the image below to view a simple animation showing how you can build up from a single level. 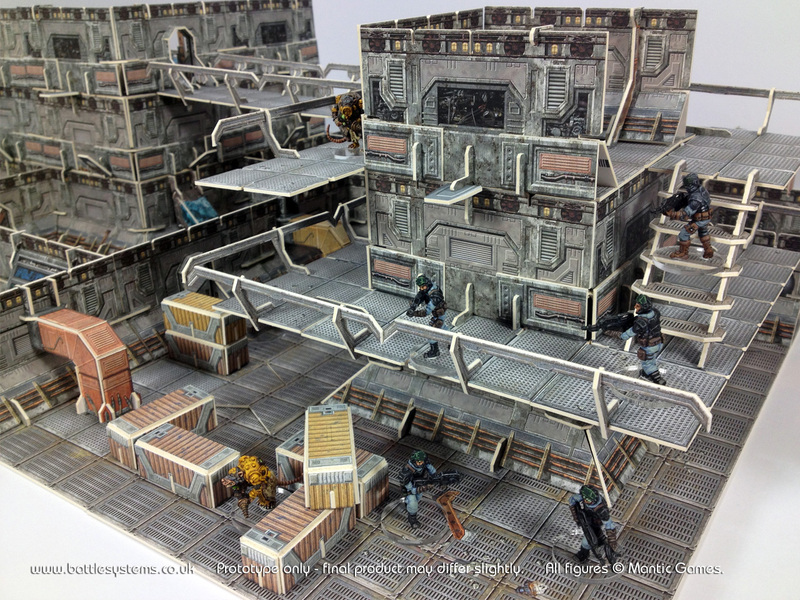 By the way, all of the figures seen in this blog were supplied by the lovely chaps at Mantic Games and painted by Rich at Sabre Minatures. Also, thanks to everyone who forwarded suggestions for the new line, barely two suggestions matched, you are a demanding lot! It’s given us plenty to think about regarding the Kickstarter, stretch goals and future projects.